Rolls-Royce is preparing a flying taxi for takeoff. Vertical takeoff, that is. 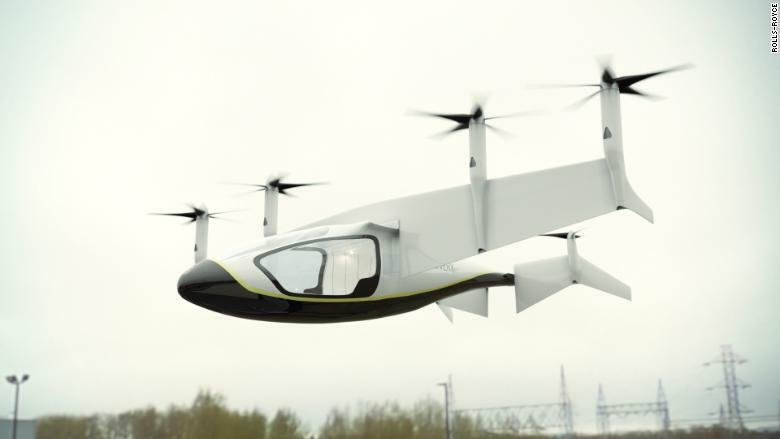 The UK aerospace company, which makes the jet engines that power many of the world's commercial aircraft, has unveiled a concept hybrid electric vehicle that would carry four or five passengers at speeds up to 250 miles per hour. 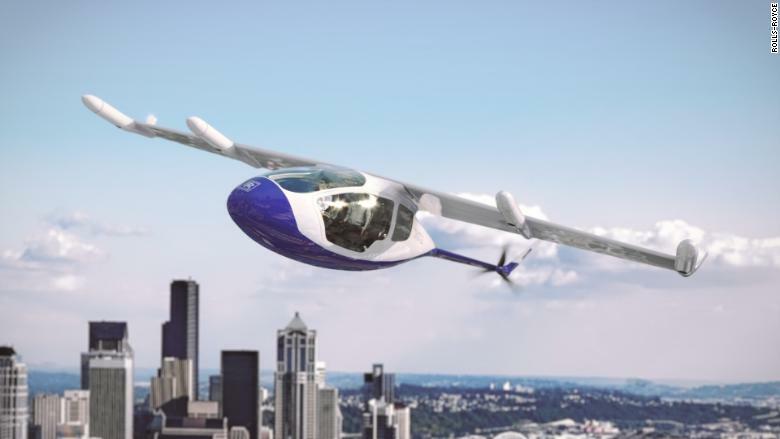 With a range of 500 miles, the vehicle would be able to takeoff and land vertically and could be used to transport people or cargo. It would be powered by six propellers, including four that would fold into the wings at cruise altitude to reduce noise. Several other companies, including Uber, Airbus (EADSF) and a startup backed by Google (GOOGL) cofounder Larry Page, are racing to commercialize flying taxis. Rolls-Royce said its vehicle could be available by the early 2020s. Rolls-Royce Motor Cars, a separate company owned by German car manufacturer BMW (BMWYY), is not involved in the project. A taxi version of the Rolls-Royce concept vehicle. Rolls-Royce (RYCEF) is seeking partners to work on its vehicle, which would rely on batteries powered by gas turbines. 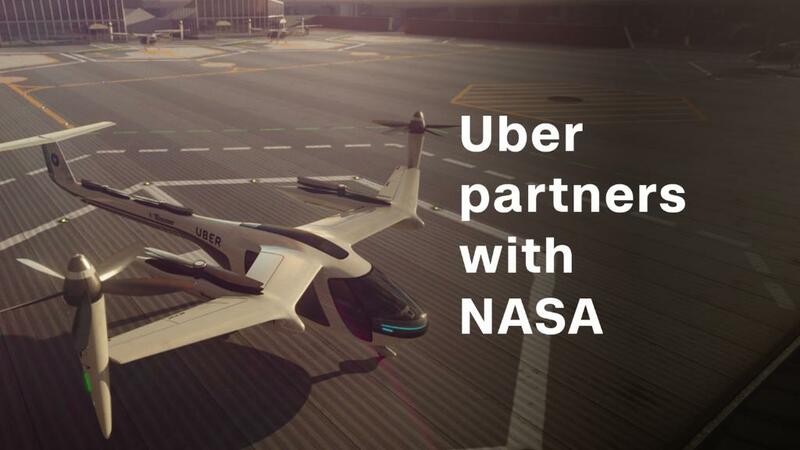 The first version would require a pilot, the company said, adding the vehicle could have personal, commercial passenger, cargo and military applications. "Electrification is an exciting and inescapable trend across industrial technology markets and while the move to more electric propulsion will be gradual for us, it will ultimately be a revolution," said Rolls-Royce executive Rob Watson. Rolls-Royce may have an edge over the competition when it comes to vertical takeoff. It designed the engines used on two military aircraft that can do that: The Harrier Jump Jet and the V-22 Osprey. The Rolls-Royce vehicle configured for cargo deliveries. Rolls-Royce is a major supplier to Airbus (EADSF) and Boeing (BA) but it has been under pressure in recent months to cut costs and resolve problems with its Trent 1000 jet engines. In January, it announced plans to focus on its core business of manufacturing engines and power systems for the aviation, defense and energy industries.